Like everything else, hair is affected by time & the aging process. Hair can become thinner, wiry, fragile, & lose its colour. 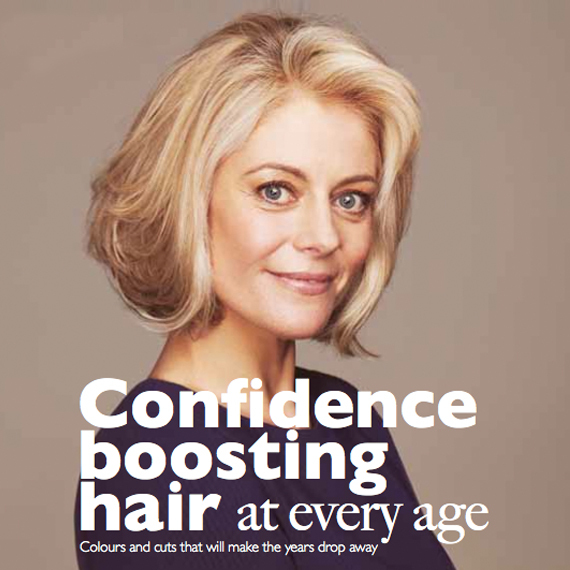 There is good news though, if hair is properly looked after, nourished, well shaped & expertly coloured it can be your biggest asset in looking beautiful, fashionable & confident at every age. Our model Katie has the Headmasters Completely Gorgeous Colour, which is an all over colour combined with highlights. It sounds high maintenance but using the next generation glossing colours the re-growth is extremely minimal as it gently softens away as the hair grows out. (If your white hair is more resistant opt for a permanent ammonia-free colour, which will cover all white hair). As we age we lose definition & tone, this can be added back in through your hair. Katie’s root is a couple of shades deeper than her brightest blonde. Her brightest blonde is placed around her hairline to blend away white hair & then the rest of the colour is warmer using more golden shades of blonde. Katie’s cut is focused on creating a bob shape, which will sit inline with & support her jaw-line achieving a sharper jaw & more defined neckline. Highlighted effects will help blend away white hairs. White hair is often more dominant around the hair line, place your lightest & brightest colours here to help with re-growth. Opt for a deeper root colour & work with a combination of golden, richer tones to inject warmth & create a glow. Gentle contrast is the most flattering option, creating shadow & light will have the most glamorous results. Use professional in-salon colorants only that are specifically designed to cover grey hair gently without drying it out. Blunt cuts can accentuate lines, softer edges are more flattering. If you are going to have longer hair than bob length you really need to take extra care with condition & styling to keep it looking healthy. Add longer layers around the jaw line & a cut which sits on or just below the collarbone is really flattering. Avoid wispy fringes – they can look straggly. A side swept fringe is a glamorous option. For short hair looks, gamine crops are super flattering but geometric shorter hair is harder to pull off (because of the sharp lines). Short hair with lots of chopping layers will disguise thinning hair, use the Nioxin System tailored for your hair type – this combined with a great colour to add depth is a game changer! Make sure you have a good cut for this shape, as too long in the back & too short on the top will have the opposite effect.